After the user visits the authorization page, the service shows the user an explanation of the request, including application name, scope, etc. If the user clicks “approve”, the server will redirect back to the website, with an authorization code and the state value in the URL query string. The following parameters are used to make the authorization request. The redirect_uri is optional in the spec, but some services require it. This is the URL to which you want the user to be redirected after the authorization is complete. This must match the redirect URL that you have previously registered with the service. Include one or more scope values to request additional levels of access. The values will depend on the particular service. The state parameter serves two functions. When the user is redirected back to your app, whatever value you include as the state will also be included in the redirect. This gives your app a chance to persist data between the user being directed to the authorization server and back again, such as using the state parameter as a session key. This may be used to indicate what action in the app to perform after authorization is complete, for example, indicating which of your app’s pages to redirect to after authorization. This also serves as a CSRF protection mechanism. Note that the lack of using a client secret means that using the state parameter is even more important for single-page apps. The following step-by-step example illustrates using the authorization grant type for single-page apps. The app initiates the flow by crafting a URL containing ID, and optionally scope and state. The app can put this into an <a href=""> tag. Upon being directed to the auth server, the user sees the authorization request. If you include a “state” parameter in the initial authorization URL, the service will return it to you after the user authorizes your app. Your app should compare the state with the state it created in the initial request. This helps ensure that you only exchange authorization codes that you requested, preventing attackers from redirecting to your callback URL with arbitrary or stolen authorization codes. The grant_type parameter must be set to “authorization_code“. 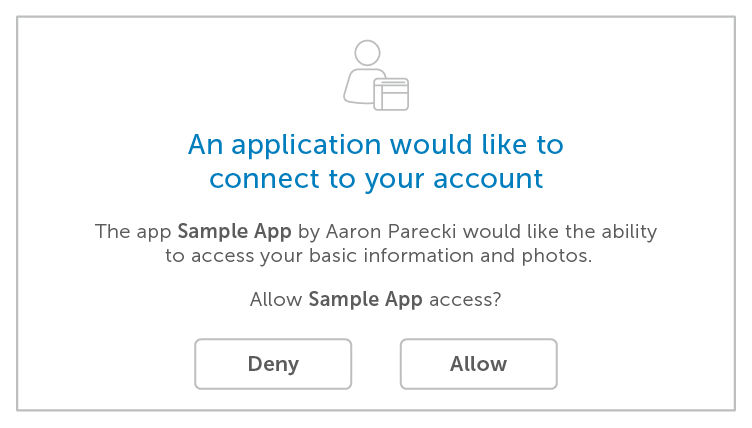 Despite the client secret not being used in this flow, the request requires sending the client ID to identify the application making the request. This means the client must include the client ID as a POST body parameter rather than using HTTP Basic Authentication like it can when including the client secret as well. Some services use the alternative Implicit Flow for single-page apps, rather than allow the app to use the Authorization Code flow with no secret. The Implicit Flow bypasses the code exchange step, and instead the access token is returned in the query string fragment to the client immediately. In practice, there are only very limited cases in which this is necessary. Several major implementations (Keycloak, Deutsche Telekom, Smart Health IT) have chosen to avoid the Implicit Flow completely and use the Authorization Code flow instead. In order for a single-page app to use the Authorization Code flow, it must be able to make a POST request to the authorization server. This means if the authorization server is on a different domain, the server will need to support the appropriate CORS headers. If supporting CORS headers is not an option, then the service may use the Implicit Flow instead. In any case, with both the Implicit Flow as well as the Authorization Code Flow with no secret, the server must require registration of the redirect URL in order to maintain the security of the flow. The only way the authorization code grant with no client secret can be secure is by using the “state” parameter and restricting the redirect URL to trusted clients. Since the secret is not used, there is no way to verify the identity of the client other than by using a registered redirect URL. This is why you need to pre-register your redirect URL with the OAuth 2.0 service.